There was no doubting the interest in Adelaide building a strong cybersecurity capability in Australia! On Wednesday, 28 November over 120 students and 16 innovative companies speed-networked for over 20 jobs and internships. 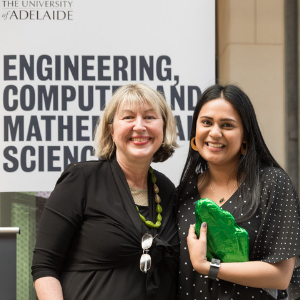 Hosted by AustCyber in partnership with CSIRO’s Data61 Ribit.net, the event buzzed with the energy and excitement of new connections and networking in a fantastic open air atrium at the University of Adelaide. Supportive mentors abounded at this event; with representatives from the University of Adelaide, UniSA and TAFESA offering advice, counsel and pitch perfection to the students. We were especially delighted to award the coveted chocolate frogs at this event given they came from an Adelaide family institution - Haighs! We also give massive respect to the team at the University of Adelaide for hosting the venue and providing refreshments to keep the networking going long after the final bell sounded! Check out the fantastic photos!